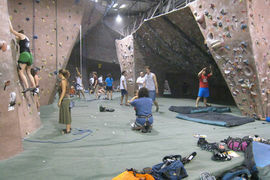 Austin Rock's South Gym offers a 10,000 square feet of climbing, including a great lead climbing area and bouldering cave. This climbing gym is located less than 10 minutes south of downtown Austin, in the South Park Commerce Center. Check out Austin Rock Gym's website for more information. with Gabriel Vanrenen, Maria Ly, Thomas Bukowski, Jakob H.